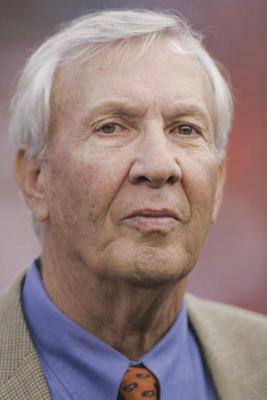 Pat Dye would have turned Jerry Sandusky in. Or killed him. That’s what the legendary former Auburn coach told the Huntsville Times before speaking to the Huntsville Quarterback Club last night. Dye called the Penn State situation “awful, absolutely awful” and said Paterno “shoulda got out when he was 65 years old, and all of the ego and all of that other stuff wouldn’t have got in his way. “And coach (Bobby) Bowden (Florida State) should have gotten out. And coach (Paul) Bryant. You get that old, you do not have the energy to recruit and do alumni functions and all the things that are demanded of a head football coach,” he said. Dye never knew Penn State defensive coordinator Jerry Sandusky, who was recently found guilty on 45 charges of child sexual abuse and was allegedly discovered in a Penn State shower room with young boy. Sure, it’s easy to talk tough when speaking on hypothetical moral dilemmas. But when you talk that tough, you probably mean it. The more I learn about Pat Dye, the more I like and respect him. Please don’t ever change Pat. Way to say it and straight to the point Coach Dye! Kudos to YOU! WDE! This why I love Coach Dye! Oh I believe Coach Dye would had taken care of him.